This is more a recipe than a pattern. 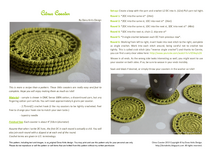 These little coasters are really easy and fast to complete. Hope you will enjoy making them as much as I did! EDIT 17/01/2012: Several knitters have pointed out that the waist shaping begins too late. It seems my torso is longer than the standard.